Grappa: Italy Bottled by Ove Boudin. (Originally published as Grappa: Italien på Flaska) Stockholm Text, 2012. Kindle download available here). Any book that is subtitled “Italy Bottled” should be about Italian wine — right? The only question is which Italian wine? Italy has so many wines, so many wine regions and so many grape varieties that the question is maybe not so much which wine as it is which Italy? So it comes as a bit of a shock to discover that this is a book about grappa, not wine, and since this is the Wine Economist blog, not the Grappa Economist or the Spirits Economist, I wondered if I would like it. Seduced as usual by all things Italian, I optimistically opened the e-book and began. What a beautiful book — that was my first impression. The photos made me wish for a coffee-table sized physical book so that I could just drink them in. But I imagine that a physical book would be enormously expensive (Amazon lists the used 2008 edition of this book in hardback at prices that start at $320 and peak out over $500. Yikes! The e-Book is only $3.99.) E-book it is, then, but this is definitely best viewed on a computer or tablet with a larger color screen. Cool photos are nice, but it’s Italy after all, so you expect physical beauty. What about the book itself (and why would a wine enthusiast care)? There are really two books here. The first can be thought of as a Practical Companion to Grappa because it really does tell you nearly everything you might want to know about this fiery liquid and in an interesting and informative way. Grappa is closely related to wine because it is distilled from vinaccia, the grape solids that remain from the wine making process. The vinaccia residue from red wine is already alcoholic, since the skins and the juice were in contact during fermentation and can go straight to the distillery pot (fresher is better, the author advises). White wine vinaccia is alcohol free because the skins were whisked away before fermentation — these aromatic solids need to be fermented before distilling can begin. So wine and grappa are related both in terms of raw materials (the grape varieties) and process, but there’s a lot more to the connection than this. 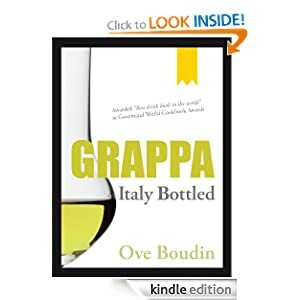 Author Boudin assumes that you probably know very little about grappa, but that perhaps you know a bit more about wine and he exploits this fact. He defines the process of making grappa by reference to wine-making, he talks about grappa terroir and he even outlines a grappa-tasting protocol that generally parallels wine tasting but is fundamentally different from it in some respects. Grappa is tasted differently from wine because grappa is a different and much stronger drink with a different purpose. Wine tasting is performed on certain occasions or moments – for example when a new bottle is opened or when a glass of wine is served – and afterwards the wine is enjoyed. A grappa on the other hand should be tasted every time! At every intake of the bouquet, at each mouthful, at every swallow and at every taste sensation and association. Grappa is a complex sensory experience that simulates an inner-dialogue as well as a discussion around the table. Good advice, I think if you want grappa tasting, not grappa drinking and grappa drunking. But good advice for wine drinkers, too. We shouldn’t take these precious liquids for granted. We should always taste (and enjoy)! The fact that Boudin’s insights about grappa often apply to wine is one of the unexpected pleasures of reading this part of the book. To pick an appropriate economic example, Boudin writes about the difference between artisan grappa and the bulk industrial product (a difference that exists in the wine world). You might expect that he would praise the boutique product and condemn the manufactured commodity. But you would be wrong. Some aficionados and purists (who only accept boutique grappa) are of the opinion that industrial distillers are a threat to the future of true grappa. However, both distillery schools have their different roles that in the big-picture presuppose each other’s existence. Customers have the right to know what they are buying. When, where, of what, by whom and by which method is the grappa made? Today, there are not enough labeling requirements to ensure that detailed information is consistently provided. The manufacturers themselves determine to a large extent what should appear on the bottle. A declaration of goods of this kind would be beneficial for the smaller artisan distillers as they could lay claim to certain quality concepts as discontinuo (batchwise production). The industrial distilleries could offer this as they have the resources, the advantage and a global market. And a stronger focus on the quality of grappa would increases the interest in grappa and consequently the market. This scenario would benefit all grappa producers. The second part of the book reports on a personal tour through Italy’s grappa heartland and it reads like what it is — a grappa enthusiast’s travelogue, complete with all the practical facts (I visited this town, stayed at this agritourismo, dined at this small restaurant, etc.) that you might expect. It is well written and useful if you want to follow in Boudin’s tracks, either for grappa or wine or simply for pleasure. I’ll admit that I didn’t read all of this part of the book. I only wanted to know one thing: Did he go to the hills outside of Asti and visit Azienda Rovero? Sue and I stayed with the Rovero family during our 2011 trip to Piemonte. We loved their wines and the local cuisine they served at the restaurant. The grappa was great, too, but I ignored Boudin’s advice and didn’t taste it in all its fullness. But I will the next time because of course he did go there and devotes ten pages to his experience. It sounds like it was one of the highlights of his journey. Grappa: Italy Bottled is a beautiful book that will interest a wide audience that includes wine lovers. Highly recommended! The photo above shows the chapel at the Rovero winery and distillery. Boudin had dinner there and so did we. Here are notes from our meal for your reading pleasure! One highlight of our stay was a meal at the family restaurant, which is generally open only on weekends. Enrico’s mother prepared a menu of regional dishes that Enrico paired with Rovero family wines. It was the perfect way to learn about the wines — tasting them with the local Monferrato cuisine while talking with the winemaker about wine, wine markets and his plans for the future. So you want to know what we ate, of course. OK, here’s the menu. This e-book’s going on my Christmas wish list. Sounds like a fascinating (and informative) read!